Pet Friendly Hotels in Mammoth and Mammoth Lakes, California! 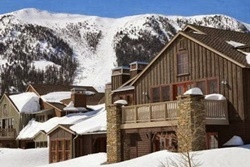 Discount Ski Tickets and Ski Rentals and Restaurants For Mammoth in Winter! Convict Lake Resort - BOOK IT! $$ This is a scenic, pet friendly resort, 1 mile from Mount Morrison and walking distance from the fishing and water sports at Convict Lake, offering simple cabins with free Wifi and parking, satellite TV and DVD players, BBQ grills and full kitchens; upgraded cabins add fireplaces or wood burning stoves, and some have whirlpool tubs. There is a general store on the property, as well as a coin-operated laundry, fish cleaning station, boat rentals, upscale restaurant with Continental cuisine, and a lounge with a martini bar. 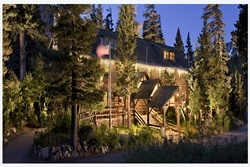 Mammoth Mountain Inn - BOOK IT! 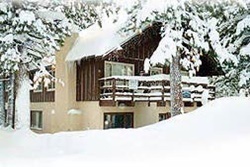 $$ Warm, traditional lodge rooms and condos; Midscale, smoke free, full-service, mountain motel, near gondola and Main Lodge; 1-2 bedroom condos, free 24-hour shuttle to Mammoth Lakes Airport, free shuttle to Village and Old Mammoth Rd from 3p-10:30p; heated, outdoor pool, fitness center, 2 restaurants, lounge, room service. Allows pets for a $50 per night pet fee; resort fee of $25 per night- includes parking and internet access. Shilo Inn & Suites Mammoth Lakes - BOOK IT! $$ This classic, pet friendly hotel has unfussy rooms with kitchenettes and free Wifi, a 24-hour indoor pool and sauna, exercise room, ski lockers, free breakfast and parking, business center, and laundry facilities. 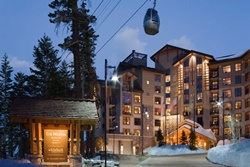 The hotel is 5 miles from Mammoth Mountain Ski Area and 6 miles from the lava domes of Mammoth Mountain. Mammoth is California's premiere mountain resort in the Eastern Sierra region where the possibilities for outdoor activities are endless. The Shilo Inn is conveniently located on Main Street off Hwy 395 and welcomes visitors year round to Mammoth, a favorite pleasure travel destination. Kids under 18 always stay free with an adult at Shilo. Pet fee of $25/stay per dog and $75 damage deposit, maximum 2 dogs; pets must not be left unattended. Rodeway Inn Wildwood Inn - BOOK IT! $$ The Rodeway Inn® Wildwood Inn hotel in Mammoth Lakes near Rainbow Falls is conveniently located off Main Street, with easy access to the Devils Postpile National Monument, Mammoth Mountain and Ski Area, Crawley Lake, Mammoth Lakes Airport, Yosemite National Park, and June Lake Village. The hotel offers free breakfast and free WiFi, an outdoor heated pool, and newsstand. M Inn - BOOK IT! 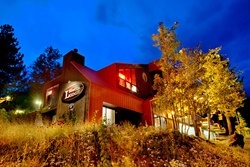 Tamarack Lodge Resort - BOOK IT! Pet fee of $30/night per pet and $200 refundable pet damage deposit, max 2 pets per cabin, pets not allowed in lodge rooms. Get Discount ski tickets for Mammoth Mountain! they are already available! Sierra Lodge - BOOK IT! $$ This is a midscale, smoke-free, hotel in downtown Mammoth Lakes with 36 rooms that have kitchenettes, and free continental breakfast, internet, and parking; no elevator or pool, microwave and refrigerator in every room, no AC in rooms! The Lodge is conveniently located in downtown Mammoth Lakes on Main Street (Highway 203), just past the Post Office and Angel’s Restaurant. Mammoth Mountain Ski Area is just minutes away and offers many winter activities. 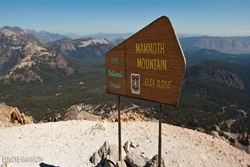 The closest Mammoth Mountain chairlift is just 1.5 miles from us. We are within walking distance to shops, restaurants and nightlife. The new Village Shopping Center is less than a mile away; the Main Lodge and the Lakes Basin are 5 miles from our front door. Yosemite National Park (closed in winter) is just 40 minutes from our front door and Rt. 120 is 25 minutes away. Pets allowed in designated pet rooms, 2 pets per room max, for a $15/night per pet fee. Edelweiss Lodge - BOOK IT! 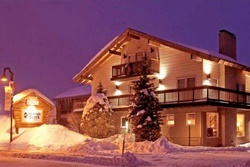 $$ Located in "Old Mammoth," this pet friendly hotel offers fully-equipped kitchens, wood-burning fireplaces, cable TV and free Wifi, with 6 buildings and 10 cabins and suites, each uniquely designed and decorated. Dogs allowed for $20/day, max 2 dogs per cabin/suites; pet fee includes a dog "welcome basket" complete with a sofa cover, waste bags, and a treat. Dogs should be well-socialized and dogs that bark may not be left alone. Pet fee of $25/stay for first pet, 2nd pet is additional $5/stay, in pet friendly rooms, 2 pets per room maximum. Mammoth Creek Inn - BOOK IT! Dog friendly rooms available for a pet fee of $29+tax, maximum of 2 dogs per room. 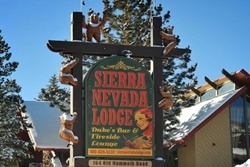 Sierra Nevada Lodge - BOOK IT! $$ Cheap, smoke free east Mammoth Lakes motel; AAA 2 Diamonds; heated outdoor pool open in summer, microwave and refrigerator in every room, free internet and parking. This remodeled resort offers more amenities than any other hotel in Mammoth Lakes, California. Located Downtown on Old Mammoth Road, it has have three excellent restaurants providing fresh and homemade cuisine from beneath the sea, the Far East, and right here at home, and also home to Black Tie Ski Rentals, providing ski and snowboard rentals. Relax by the pool, whirlpool or fire pit, enjoy winter sports, and local sites and attractions. Dogs up to 100 pounds are welcome for an additional $25 cleaning fee per dog, 2 dogs maximum per room; pets must not be left unattended. Westin Monarche Resort - BOOK IT! 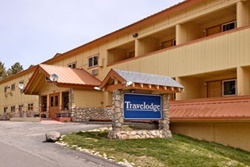 $$ Upscale, smoke free, full-service hotel, near Mammoth Lakes Village, 13 miles from Airport; free 24 hour shuttle to airport and Wifi, heated, outdoor pool, exercise room, restaurant, lounge. 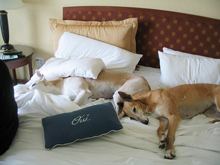 Pet friendly with no pet fee, pets must not be left unattended in rooms.